Euro Med Spa receives a lot of calls from people interested in Botox Injections. We noted down all frequently asked questions and decided to share some	Botox facts and myths with you. Make sure your provider is a certified BOTOX ® injector and has enough	training and experience. Ask to see before and after pictures of the provider’s clients, not	pictures which come from the manufacturer. Ask what the dilution rate is. Ideal dilution rate should be 1:1, otherwise	you will get more water then product, results will not last and the treatment	might have adverse side effects. Q:	Will my face be “frozen? A: Here at Euro Med Spa we believe in moderation and Dr Iqbal suggests	to his clients the ideal number of units, offering them to come back for	a follow-up and lets clients decide if they want few extra units. 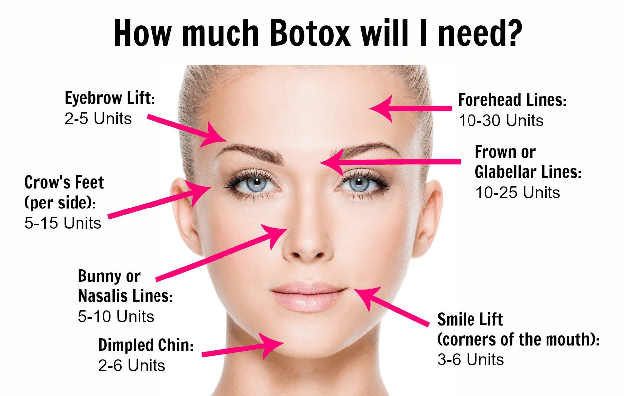 Q	: Is Botox® a toxin? A: Botox is not a toxin, it is a purified protein from Clostridum bacterium	which helps relax muscles and get rid of unwanted wrinkles. You will start	seeing results within days and they will last few months. Q:	How often should I have injections? A: Dr Iqbal recommends to have initial 3-4 treatments 3 months apart and	once the muscles are trained to stay relaxed the treatment can be done	less frequently. Q:	Why do some people have unwanted side effects? A: Unwanted side effects of Botox® injections are usually associated	with poor injection technique and lack of injector experience? Such complications	occur because the toxin diffuses, leading to unexpected muscle weakening. With more concentrated doses (1:1), physicians can accurately place the	Botox® with a greater duration of effect and less diffusion. Here at Euro Med Spa all injections are performed by Dr Iqbal who uses	advanced techniques when injecting Botox® and Dermal Fillers and uses	the most effective concentration of Botox®, so that you get actual	product, not water. Q:	Who performs the injections? A: Dr Iqbal performs all injections himself, using advanced techniques	and ideal concentration of Botox®, so that Botox® is less likely	to get to the unwanted areas. Dr Iqbal is an actively practicing Medical	Doctor with over 22 years of experience, a Diplomat of Anti- Aging Medicine,	and AMA member, he is a certified Botox® Injector. Q:	Will I bruise after the injections? A: Dr Iqbal advises to stop taking blood thinning* medications 3 days prior	to your appointment and if you bruise easily it is the best to start taking	Arnica supplements available at GNC at least 3-4 days prior to your appointment. In most cases clients don’t bruise. * Vitamin E, Fish Oil, Aspirin and some other products may contribute to	the blood thinning. A: The Botox needle is slightly thicker then a hair, very few people are	a little sensitive but mostly clients feel no discomfort. We can cool	the injection site with the ice or apply topical anesthetic if needed. Q: How many units of Botox® will I need? A: Each face is unique and different, that’s why it is impossible	to offer the same amount of Botox® units to everyone. During your	complimentary consultation Dr Iqbal will suggest an ideal number of units	for you depending on your particular needs and areas you want to improve. This allows us to offer you the most effective concentration of Botox®,	not a diluted version.